Welcome to the hotel La Casa de los Trece Arcos. 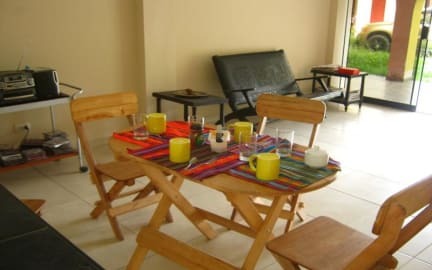 It is a friendly and comfortable property located in Urubamba. We offer comfy beds and a delicious breakfast is included and served daily in a cosy place surrounded by trees and corn fields. There is a spacious parking and plenty space to move around and take a sunbath or make a bonfire. We accept pets and no extra charges applied. The hotel La Casa de los Trece Arcos is located in a rural zone, near to little pine forest and corn fields. 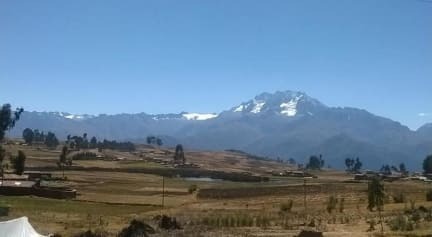 The hotel is located from Urubamba town at 5 km away and 14 km from Ollanta train station. Saint Peter Church is 5 km from La Casa de los Trece Arcos, while Main Square is 5 km away. Alejandro Velasco Astete International Airport is 36 km from the property. We have two rooms with twin beds, one room with double bed and one with three single bed. Each room with private bathroom (hot water every time), warm blanket, soft sheets, desk, lamp. Also we can add another bed into the room for an extra price. For example, triple room can convert into a quadruple or twin room into a triple. For more information, please do not hesitate to contact the property. Please note: No 24-Hour front desk - Opening time is: from 7 am to 9.30 pm. Taxes not included - Based on local tax laws, Peruvian citizens (and foreigners staying more than 59 days in Peru) must pay an additional fee of 18% .To be exempt from this 18% additional fee (IVA), a copy of the immigration card and passport must be presented.